Gunung Agung is a mountain deserving of considerable respect. It is not the half day jaunt of Gunung Batur which is probably the most popular climb in Bali. 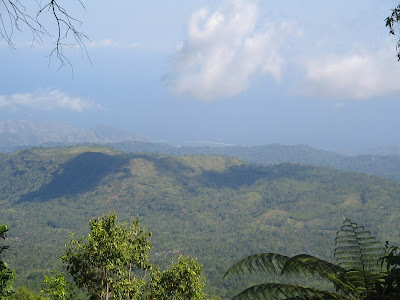 It is the mountain of the gods, the highest peak in Bali and it controls the climate for much of the surrounding area. The locals told me there are ghosts up there and I met them. It is not a mountain that needs ropes and not quite high enough for altitude sickness but it can kill and according to colleagues often does. How often, I’m not sure as I don’t know of any figures from which to quote. Indonesia is odd like that; disaster is regular and death common so that no one fusses too much about another. Get in trouble here and don’t expect much assistance. This account is from the perspective of a person in their mid forties 7 kilos overweight and moderately fit. If you are younger and stronger it may seem a bit exaggerated. I’ve since come across an account by Greg Slayden where he claims to have taken four and a half hours to the peak. This is so quick I find it difficult to believe, but it puts my own journey into perspective and makes it seem somewhat pitiful as I felt I could easily die up there. 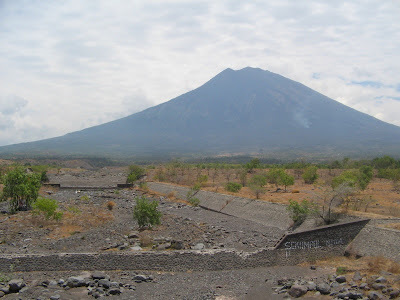 The eastern side of Gunung Agung is a dry and barren place. This view is from the east coast. Looking down from the start of the climb at Pura Pasar Agung, on the southern slope of the mountain, near Selat. This is at the end of a steep road that has already climbed to a considerable height and it is reputedly 4 hours from here to a point about 100m lower than the main peak. Besakih is a major Hindu temple complex. I arrived in Besakih by car at 11.00pm Saturday 3rd February 2007 after an active day. This was an act of disrespect. It was already too late to commence and you should start fresh and with a mind set that can only be achieved with a few hours of contemplation. A better start would be to sleep in Besakih the previous night, adjust to the climate, eat well, sleep in the afternoon, meditate and commence about 9.00pm. Arriving late had the advantage that the rapacious panhandlers were not around. I was able to drive up the temple road divided by a median strip as far as it goes. In the day this is forbidden and this hill must be walked. Then at the top, U turn around the median strip to come down and just as you start to descend there is a road off to the left, follow this to a “T” intersection, turn left and after a kilometre or so you come to a car park that can hold about 20 cars next to a footbridge that crosses back over to the temple complex. This is a great spot to begin, It is already two thirds of the way up the temple complex and seems a safer parking spot than in the more obvious market place directly below the temple complex. There must be other roads to get here during the day but I didn’t check. At 11.30pm I was packed and ready. Three 1.5 litres bottles of water, some sweet bread rolls and biscuits, poncho/ground sheet type rain gear, a jumper, 2 spare shirts, sunburn cream, a torch and 3 sets of D size batteries. This was roughly right but I should have had some insect repellent. I didn’t notice getting bitten but later my arms were covered in mosquito bites. I could have got away with one less bottle of water. I only used 2 sets of batteries, additional warm clothes would be good as a safety measure and I discovered later my poncho was only moderately waterproof and not up to a deluge. I was alone in a strange place, it was raining lightly, I was already a little weary and the mood just wasn’t good. I almost backed out and it would have been wise to have done so. Agung needs to be respected and I hadn’t yet realised that. Crossing the footbridge and following the path up the centre of the temple complex, I passed groups of people chanting, but no one saw me, which suited as I didn’t want to be harassed. From here on I had that whole mountain to myself, which was a surprise and perhaps a sign of the respect Agung is accorded. Most mountains in Asia are climbed by so many people that you are never alone. There are guides in Besakih and you might prefer to climb with one. The cost for a guide is US$50. Compared to the salaries obtainable locally this is a huge sum but the guide doesn’t get it all. The guiding is controlled by a guild which takes a substantial fee from each climber for the guild then allocates the guide from the top of their list. Having got a job, a guide drops to the bottom of the list again which, while being very fair, provides little incentive for quality guiding. There is lot more people wanting to guide than there is climbers so that it can take months for a guide to get back to the top of the list. This provides some incentive to cheat so that it may be possible to engage a guide and cut out the guild. There is some benefit in the guild as they provide some care and maintenance of the route, and ensure the guides don’t rob the climbers. Locals generally climb with friends who have been before and don’t use a guide and I avoid them whenever possible. In past trips I’ve have had good guides but I’ve had terrible ones as well, sometimes surly, sometimes less fit than me and not up to the ardour of the journey. I was supposed to be climbing with some local friends and friends of friends but the group which at one stage had been seven people dwindled until the last one dropped out a few hours before I left. This is not unusual in Indonesia in my experience. Above the temple complex there is a street of art shops and a little higher, houses. This road must be accessible via a route from the left side of the temple complex as the ravine to the right is too deep to cross this high up and there is no road through the complex. It may be possible to park here somewhere and it would be convenient but there is not much space and it is steep. At the end of the road there is a set of steps leading upwards and a path to the left of the steps. Take the path. This is the last junction at which the steeper path is not the correct route. From here on if there is any doubt as to the correct path always choose the steepest. It is constant ascent from now until almost at the top, fairly gentle at first but mostly steep, arduous and unrelenting. Follow the pink paved path for the next few kilometres passing through farmland and a few structures. About 15 minutes along this path is a small shop that sells simple meals and drinks. On an earlier reconnoitre I asked if I could sleep here and was told I could for a modest sum. The woman, who was alone, showed me a small room with a bamboo bed and no mattress. This could be a spot from which to eat sleep and prepare for commencement as it is past the panhandlers and art shops and far enough up to soak up the atmosphere of the mountain. Eventually the path of pink paving stones ends at a temple. This is the last structure you will see and from here the path is a dirt track and frequently washed away but is easy to follow. It is still farmland for a few more kilometres and gradually the foliage changes to an open forest which is fairly heavily chopped for firewood. It is very humid and warm so that I have a sheen of sweat from the exertion. The light rain stops now, I hadn’t donned rain gear and while my shirt is wet it is probably more from the sweat than the rain. There is partial cloud but through the gaps a full moon is providing plenty of light. It is quiet and quite beautiful climbing upwards trough the open forest. My mood improves and I’m now enthusiastic about the journey ahead. After a while the cloud clears, during the night I climbed through the cloud and in the morning I can see it far below me. Also the spur I am climbing narrows so that I am climbing along a narrow path with the ground dropping steeply away on both sides. The forest gradually gets thicker turning into jungle and the path gets steeper. While the moon is still providing plenty of light the jungle is preventing much getting through to ground level and the rough path is hard to see. The route is clear but the holes and washaways are not. I stumble and trip and am a little worried about tumbling over the side. I use the torch now with mixed results. Without it I can see a fair way ahead but the path is all shadow, with it my immediate surround is well lit and choosing the next foot placement easy but outside the pool of light is an inky black so that my world shrinks to a few metres and it feels like I’m in a small enclosed space. After two and a half hours I stop for my first rest break. I am lathered in sweat but it is cool when I stop. It is very quiet though occasional snatches of barely audible conversation drift up from the valley below. A half a litre of water and I check the signal strength on my phone. It is GSM, using Telkomsel as the carrier, and has one bar so that while it works here I suspect it will not for much further. I send off some SMS’s to colleagues and family, I really love modern communications, sitting here in the jungle seemingly far from anywhere but still connected. It changes everything. In my youth I used to come to these parts of the world and the occasional three minute phone call home had to be booked the day before, frequently failed or was inaudible and cost the earth. Communication was mainly by post and post restante for incoming mail. Mail each way took weeks so that you were effectively cut off. With mobile telephony it’s like being down the street. Sometimes when I’m in Indonesia I divert the phone from the office. If I’m somewhere quiet when rung and it’s a good line the caller thinks I’m sitting at my desk and it can feel quite surreal being physically in one world but participating in another. The oddness comes from the different mind set a few days here produces and casting this off for the period of the conversation seems strange. Almost everyone here has a mobile as well and while its much cheaper than home to make a call it’s very expensive when the average salary is well under A$100 per month. This shows how much we value communication. The screen of the phone is blindingly bright in the darkness so that I can see nothing else as I tap out the SMS. I like the mixture of modern technology and a jungle not much changed for hundreds, perhaps thousands of years. Its 2.00 am now and a loud bip bip indicates one of my SMS’s has been answered. I was wondering whether it might be a bit rude to be messaging at 2.00am and it seems I’ve woken someone up. This is the colleague who was most strident in his promises to be here with me. He tells me he had been awake and wondering where I was. I reply then get moving again, I am cold now. My legs don’t work well at first. They feel somewhat detached, not painful but not very obedient. Another bip bip so I stop and reply again and we keep up an SMS banter on and off for an hour or so as I climb slowly and purposefully upwards. The signal strength is 2 bars in some places but full in others so that I wonder if the coverage might last longer than I expected. I’m also wondering why I haven’t seen anyone else, perhaps others left earlier and are ahead. The ground is steep and a soft soil that has been washed away in places but is held together by the vegetation so that sometimes I am clambering vertically up exposed tree roots. I often need my hands to climb which makes it difficult to direct the torch light usefully. A head lamp would be convenient but the torch is OK. 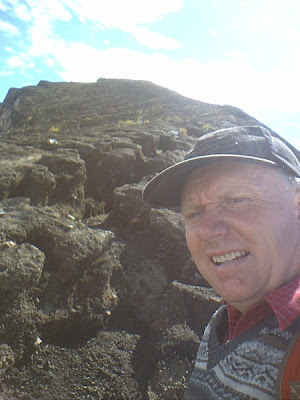 Conditions are ideal now, there is no cloud and the temperature has dropped to perhaps 10-15 degrees so that I am still warm as I climb but sweating much less. About 4.30 am and another rest break. I put on a jumper as soon as I stop as it is immediately cold without the exertion of the climb. Another 300ml of water, some sweet bread and off again but this time starting is much harder, my legs take longer to begin functioning properly and are rubbery. Keeping my jumper on I resolve not to stop again as it’s too hard to restart. I’m happy, determined and pushing onwards. A bit after 5.00am and another bip bip. I’m asked how much further to the top. I advise I haven’t any idea as I can’t see the top and am told I’ll have to hurry to get there at dawn but it shouldn’t be far as its 7-9 hours to the top. I wonder about that because while I’ve been climbing steadily I know it’s been slowly as well. I am pondering the loss of youth and the extra kilos around my waist, trying to remember whether it used to be this hard. I don’t think it was. By 5.30am it is getting light and the jungle has thinned to open woodland, not quite as steep but still a constant climb. I pass a few small flat open areas ideal for camping and obviously used for that purpose. In the best spot there is a tree branch has been set up as ridge pole above a grass area nestling in sheltering bushes. A couple of ponchos/ground sheets clipped together would make a good tent here. This is how I should have done it I think. If I’d left Besakih at say 6.00 or 7.00am I’d arrive here early afternoon and then I could rest and sleep starting again from here at perhaps 4.00am refreshed again for the climb to the top. Against that is the extra effort required to lug bedding and cooking utensils up the mountain and a night less comfortable than a hotel but which could be much more spiritual with the right frame of mind. Reasonably warm bedding will be required as its cool here. I am seriously tired now but with a strong resolve to press on. I emerge from the woodland into an open area. In front of me is a cliff and above that looking no more than 200 metres away is the top of Agung. My spirits soar; it looks like I’ll get to the top not too much over the seven hour minimum. There are no people anywhere which means I own this mountain and soon Agung will be conquered. I am high as a kite, master of the universe and delusional but I don’t know it yet. There is a rubbish tip here and areas large enough for dozens to camp. The rocks are painted extensively with names, dates and slogans including an advertisement for an art shop. The obvious route is to turn left follow the cliff around to a small valley and then continue up that valley. There is little vegetation here and the volcanic scree is unstable making it difficult to traverse. It is steep and a hard climb but I speed up, as though the dawn has passed I want to get there before it gets much later. The valley ends at a small cliff perhaps 5 metres high and it looks climbable but I’m starting to wonder. I can see where others have climbed but most of the way there’s been a major path and this looks less frequented. What if I fall and break a leg, there is no one else here, and my legs are like rubber now, no longer very obedient. I follow the cliff line around the top of the valley back towards the direction I’ve come from, but higher up. There are several other spots I see where others have climbed and feel sure I could have climb up if I have to. One of the best is a tree which is close to the cliff. I could have scrambled up the tree and cliff together but as I approach I slip and slide down a couple of metres in the loose rock. The fall hurts, I’m not injured but the pain dampens my enthusiasm and makes me ponder what it would be like if I was injured. The feeling of elation at owning the mountain changes quickly to one of loneliness and fear. I continue cautiously around the top of the valley and spot the path I should have taken. The correct route on seeing the first cliff is to follow it around as I did but on entering the valley to turn backwards and proceed up a narrow track that takes you back on top of the cliff just above the point where you first encounter the cliff. It’s quite easy to see but requires you to look backwards which I hadn’t done. This track puts me back on top of the spur that I have been climbing all night. I didn’t want to drop back down then climb again so I followed cliff base around to the path but the ground is loose and I am very cautious now. I make the path then climb back on to the spur. I am exhausted and having a crisis of confidence, the elation is gone. The wind starts and in a few minutes it is howling and cold. evidence that a lot of others had come this way. If you do climb back on to the spur you are again on the correct route. I wasted a lot of time here. Small cliff at the end of the valley. There are indications that others have climbed up here. The correct path to get back up on the spur. This is from near the top of the path and it proceeds from near the small tree in the right of the picture to the two trees at the top of the picture. Not difficult to see but you have to look backwards after entering the valley so it easy to miss. On top of the spur is an area of washaways and the walking is slippery and difficult. I get into one with a flat sandy bottom about a metre wide and a metre and a half deep and pretty much collapse. The wind is howling above but it’s quite sheltered here. The ghosts come for a chat though I forget what they said. I drink a few times, finish my first water bottle and start another, eat some bread then later a full packet of biscuits. Perhaps I was here for an hour and a half, I’m not sure as I pretty much lost track of time from here on. I’d check the time every now then but a few minutes later couldn’t remember what it was. After a while the ghosts left me alone and I felt myself back in control. My strength and confidence were returning. I decided to send an SMS but it failed, there was no signal in the hole and I hadn’t noticed. Climbing out of the hole the signal was strong and I went to resend the message. I was finding it all too complicated. I wasn’t sure whether I’d succeeded and gave up. I got back down in the hole and as I lay there it occurred to me that if I was finding it too complicated to work the phone I wasn’t in control quite as much as I thought. Safety was my first priority so I decided to abandon the summit and head down. The wind died down as quickly as it had started and conditions were good again. I emerged from my hole and took a few pictures. I was cautious now but the weather was good again and the top looked no more than 300 metres away. I felt strong enough again for that short climb so changed my mind and headed up again. I contemplated that nearly four hours ago I’d first decided I was 200 metres from the top. By now I could see how delusional I’d been when I first thought I saw the summit. This sort of realisation is the greatest benefit of a trip like this, it puts you in touch with an inner self that the conscious self can easily fool itself into believing it is aware of but isn’t. This realisation though is always in retrospect leaving open the possibility that even at the point of realisation I am still out of touch and perhaps will discover this later or maybe remain forever disconnected and never realise. Pondering on this I wonder if you are ever aware of yourself or is your conscious mind always an illusion. You can peel away layers but maybe there is always another layer below. Maybe your soul is like the mountain, revealing more of itself as you climb but the purity of the summit is one of barrenness. You get an overview but all that is life giving is in the valleys below. Walking onwards I look back regularly, fixing the route in my mind. It seemed it would be easy to go the wrong way down. A larger spur headed off to the right of the correct route, going around the far side of the valley I had been in earlier. I made a note not to follow it when I turned back. It was warming up now as well and I could see the clouds below climbing rapidly up the valley as they warmed. The phone rang and I could make a voice from home but it was breaking up too much for a conversation, a while later it rang again and I could make out the voice of a local colleague but again it was too broken up to converse. The signal was full strength but GSM only works for about 20km so I expect the problem was being too far from the tower. SMS was fine though. As I approached the top and I could see another peak a few hundred metres further on revealing my current goal be a false peak. This was immensely disappointing but it wasn’t too much further so I continued on. Again a false peak and I seriously contemplated heading down but continued. The ghosts had rejoined me and we discussed whether I was still delusional or my conscious mind was communicating with an inner self. These ghosts are very vague, they don’t state facts or tell truths but just ask questions every now and then and mock when they are unimpressed with the answers. They seemed pleased each time I discovered another false peak and I wondered if there was a message in this or were they just getting pleasure from my disappointment. This happened several more times, but I lost track of how many, it was all a bit vague now. “Just let go” was what they’d told Cecilie Scott when he’d climbed the other route a few years earlier. The path was narrow, dropping steeply away on both sides. The walking became easier and less slippery. I was walking around the edge of the caldera at least I think I was, the cloud had risen up to surround me and I could see perhaps 50 metres ahead. I was starting to wonder whether I would find my way back down in the mist, and asked the ghosts. As usual their answer was indirect but they didn’t seem very confident either. Then the path ahead started to descend. This was astonishing; it was the first descent since Besakih and I didn’t want to head down again. Another climber on a clear day took a video from this point. For a few seconds the mist cleared and I could see that after a short descent the path rose again to an irregular shaped mound. A bit later and I was there but the wind had come up again and the cloud was so thick I could see nothing, I turned for home with a sense of relief. Emerging from my shelter in the washaway and looking up towards the first false peak. It was a slow descent, I feared injury and felt certain that if I didn’t get myself down no one else would either. It was loose slippery rock and more difficult walking down than up. If I did get hurt it would mean a night up here and with the high wind I doubted I’d last until morning. I didn’t lose my way, one useful guide being the painted rocks. Any solid surface, of which there were few, was painted with someone’s name and I looked for them as I descended. Once back at the base of the first cliff walking was much safer and I sped up. Heading down through the woodland, then into the jungle. The ground was soft now and a serious injury much less likely. About half an hour into the jungle and the rain started. Not gentle this time but a deluge, I donned my wet weather gear but it wasn’t up to the task. Gradually the water soaked through until I’m sodden and cold again. It’s the middle of the day but with the cloud and thick jungle it is dim, not so dim I need the torch but not that easy to see either. I get an SMS and struggle to reply inside the poncho without soaking the phone. The battery indicator is low and it’s just all too difficult. I ignore following messages and continue the descent. I try to go faster I just want out now, the ghosts are gone and my legs are hurting badly. The right way to walk here is a semi controlled plunge, not balancing after each footfall but absorbing some energy and looking for the next foot fall while plunging downwards, grabbing branches and trees to steady yourself as they rush by. My feet are ankle deep in running water most of the way, I’m on my backside from time to time but not painfully as I slither down the mountain. I remember this from my youth and am surprised I’ve forgotten the skill. I gradually get better at the semi controlled plunge but my legs are failing me. The pain is intense, they have progressed beyond rubbery to jelly like and are quite unpredictable. I stop for the pain to subside too often and find it needs considerable will to restart. I never sit and rest but keep noticing that I am immobile again. I long to stop but if I don’t get down that would mean another night here and that would be horrible. My phone battery is failing now and the handset periodically rings out its distress. I have no idea how much further I have to go but it’s always much further than I expect. Eventually the jungle opens up to woodland again and it gets lighter but this also seems to go on much further than I remembered. With a distress call more mournful than the previous few the phone shuts down, I should have been more careful with the battery in case I was in trouble but I shouldn’t need it now. Finally the rain stops which is wonderful and I’m in farmland again. I figure I’m home for sure and sit for a while. I remove the rain gear, and I’m warm, still soaked but very comfortable in the afternoon sun. I drink, finish the food and am surprisingly hungry. There is still one full water bottle and one half full after I have drunk. Getting started again seems too hard and I drift off to sleep for a while lying comfortably in the dirt. Off again and walking really hurts now, I hit the souvenir shops above the temple complex as they are closing and one sells me a coffee. It is approaching dusk when I cross the footbridge to my vehicle. A change into dry clothes does wonders for my spirits. I’m really too tired to drive but I don’t want to stay here so I start back, planning to stop along the way. But once moving, finding a place to sleep just seems too complicated. It’s easier to keep driving, so I continue on, getting lost somewhere between Denpasar and Kuta. I finally hit Kuta at 10.30pm, connect the phone to the charger to send an SMS advising I’m down, have a wash and then dream land. In the morning I don’t wake till someone rings at 9.00am and in my half consciousness I tell them I feel great. I get up, and then fall down. I can’t walk at all, and I feel awful, lots of mosquito bites and bad sunburn. Its 11.00am before I try again. By the next day I can walk stiffly but I have a light fever and a bad stomach. It is a few days more before I am reasonably healthy again. Gunung Agung is a great mountain but I’d done it badly and gone too far into my reserves. I hadn’t respected the mountain and it had punished me, though not too harshly. The ghosts don’t feel as real and those thoughts of death seem daft from this safe and comfortable distance. I console myself in the knowledge that Cecilie Scott only got half way up, but how Greg Slayden managed it in four and a half hours I can’t imagine. Looking back down the mountain from a point near the summit during a short break in the clouds.